This discussion is being used to collect information about the CONCOMP project. Bolas, Bruce J, Springer, Allen L, Srodawa, Ronald J, The MAD/I Manual, CONCOMP Project, University of Michigan, August 1970, 197 pp. 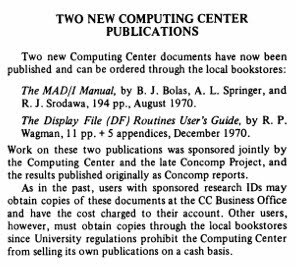 Cocanower, Alfred B., The DF Routines User's Guide, CONCOMP Project, University of Michigan, May 1969, 79pp. Mills, David L., The Data Concentrator, CONCOMP Project, University of Michigan, 1968. Mills, David L., Di Giuseppe, Jack L., and Gerstenberger, W. Scott, Data Concentrator User's Guide, CONCOMP Project, University of Michigan, April 1970. 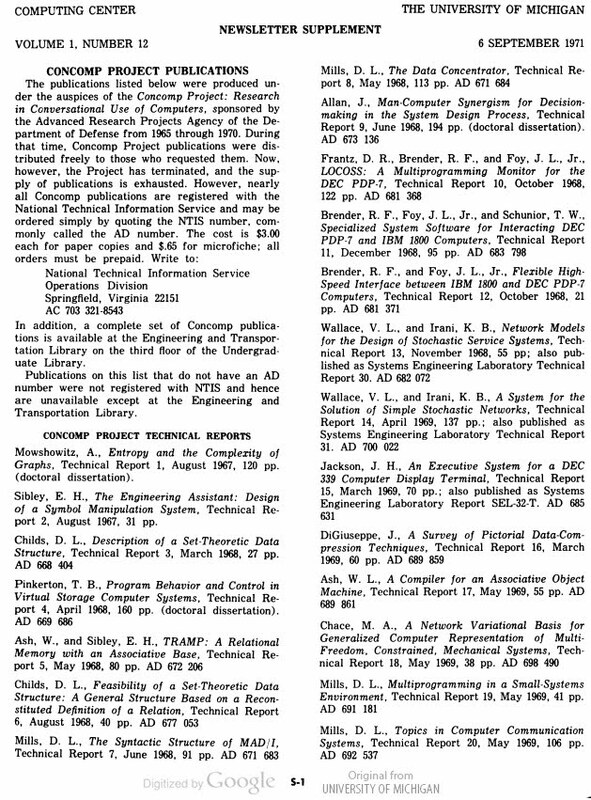 Mills, D. L., System/360 Interface Engineering Report, COMCOMP Project, Universitiy of Michigan, November 1967, 1990pp. Pinkerton, Tad B., The MTS Data Collection Facility, CONCOMP Project, University of Michigan, June 1968, 56pp. Smith, Douglas B., The audio response unit user's guide, CONCOMP Project Memorandum 27, University of Michigan, April 1970, 32pp. Taylor, Robert W., MOMS: Michigan's Own Mathematical System, CONCOMP Project, University of Michigan, April 1970, 172pp. 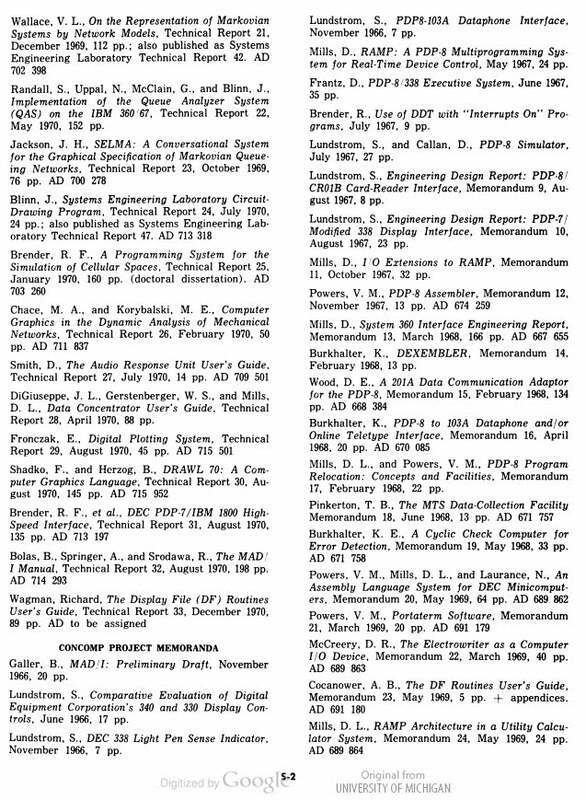 Westervelt, F. H., CONCOMP : Research in Conversational Use of Computers : Final Report, University of Michigan Computing Center, 1970.